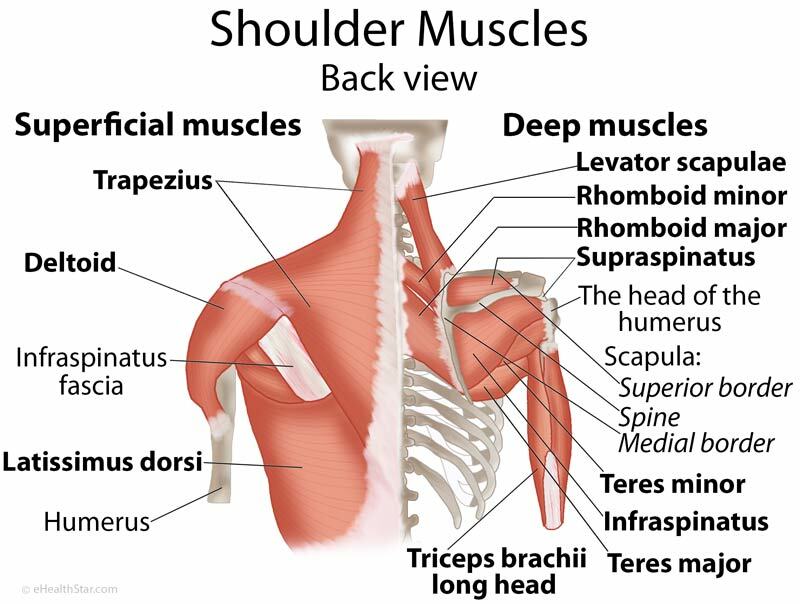 Shoulder muscles move the shoulder blades and upper arm bones. The main shoulder muscles are trapezius, deltoid, pectoralis major and 4 rotator cuff muscles: subscapularis, supraspinatus, infraspinatus and teres minor. The list of muscles and their functions are presented below. Muscle attachments (origins, insertions) are described in the video at the bottom of this article and in the articles about the shoulder girdle and shoulder blade. Deltoid (anterior head) Flexes the upper arm forwards and rotates it inwards (internal rotation). Pectoralis minor Draws the shoulder blade forwards and downward. Coracobrachialis Flexes the upper arm forwards. Biceps brachii Flexes and supinates the forearm and slightly flexes the upper arm in the shoulder. Subclavius Depresses the lateral part of the clavicle. Trapezius Elevates and depresses the shoulder and brings together (retracts) the shoulder blades. Deltoid (posterior and middle head) Moves the upper arm sideways (abduction), brings it to the body (adduction), extends it backward and rotates it outwards (external rotation). Latissimus dorsi Adducts, medially rotates and extends the arm. Rotator cuff muscles: Move the upper arm in the shoulder joint. Rotates the upper arm inwards (internal rotation). Moves the upper arm sideways (abduction). Rotates the upper arm outwards (external rotation). Rotates the upper arm outwards and brings it to the body (abduction). Levator scapulae Elevates the shoulder blade. Teres major Extends the upper arm backward and rotates it inwards (internal rotation). Rhomboid major and minor Bring together (retract) the shoulder blades. Serratus anterior Moves the shoulder blades apart (protraction). Triceps brachii Extends the upper arm backward and moves it toward the body (adduction). Teres minor functionality is shown as external rotation, and abduction instead of adduction. Just typo error. I. Just wanted to inform as this is article and one typo shouldn’t take credit away. It’s functionality shown correctly as adduction when I clicked teres minor hyperlink .